Teachers, please pass this post on to your students so they may explore this remarkable sighting opportunity with their parents and families. Depending on your location you might be able to see the International Space Station fly over your town while Student Spaceflight Experiments Program (SSEP) Mission 7 Odyssey II experiments are aboard. Odyssey II arrived at Station on Sunday, April 10, 2016, with the grappling and berthing of SpaceX Dragon CRS-8. Odyssey II was then brought through the hatch onto Station, and payload operations began on Monday, April 11, 2016, on designated SSEP Crew Interaction Day A=0 (Arrival day). British Astronaut and ISS Flight Engineer Tim Peake has been assigned to SSEP payload operations, and has now activated 9 of 25 Odyssey II experiments. You’re invited to read about the Odyssey II student researcher flight teams and their experiments by downloading the Mission 7 to ISS Media Package on the Mission 7 Media page. You’re also invited to read Astro Tim’s bio and follow him on Twitter @astro_timpeake. He arrived at Station on Soyuz TMA-19M on December 15, 2015, so today is his 4 month anniversary in space. (Here’ a thought – send him a Tweet wishing him a happy fourth month on ISS. Really. He might even reply from 259 miles up.) 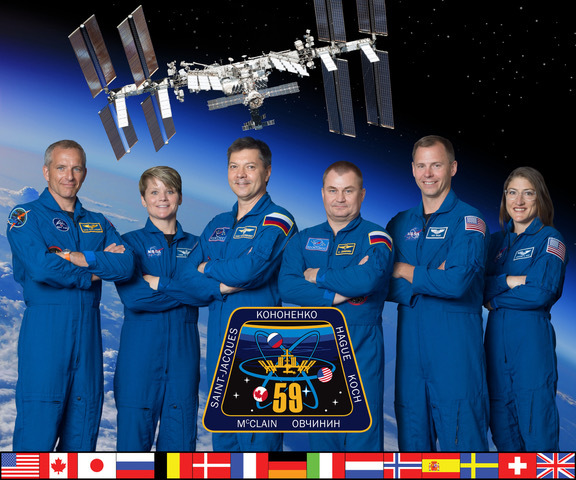 FYI – there are five other astronauts on Station right now, including Station Commander Timothy Kopra (USA). To see who is on Station, when they arrived, and when they are returning to Earth, look in the right column, below the countdown clocks. Odyssey II will be on Station until May 11, 2016, with Dragon separation and de-orbit from ISS expected at 9:26 am EDT, and splashdown expected 2:56 pm EDT off the coast of California. Note the Mission 7 clock in the right column, which is now counting down to splashdown. We are now 25 days 22 hours to return to Earth and recovery. 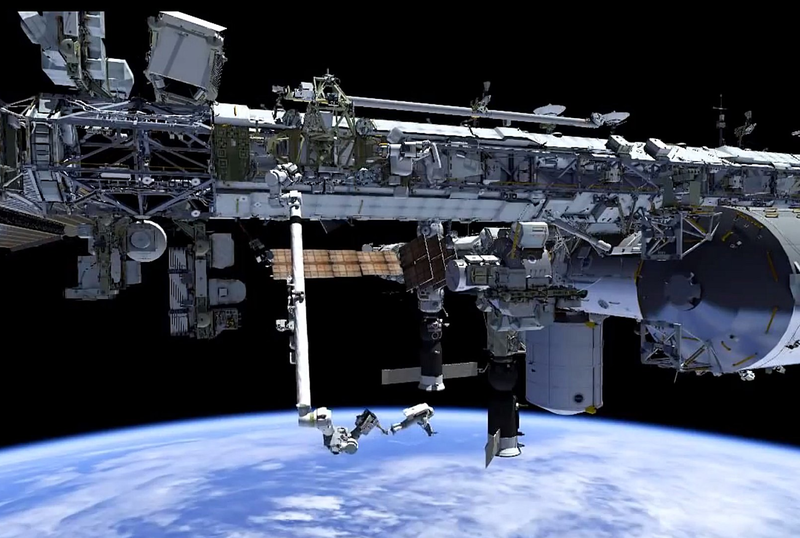 While Odyssey II is on Station we’d like to show you how to spot ISS flying over your town. It’s pretty simple, and would be a remarkable experience for the over 30,000 students across the U.S. and Canada that have been engaged in SSEP Missions 7 through 10, the 4 currently operational SSEP Missions. You may not know this, but the International Space Station is the second brightest object in the night sky after the Moon, and has been flying over your head in plain sight (and likely unnoticed) for many years. NASA’s Spot the Station website has been allowing the general public to determine when Station will be flying overhead, and even allows you to sign up for email notification in advance of a Station over-flight of your community. In late 2015, in support of the Student Spaceflight Experiments Program, the National Center for Earth and Space Science Education suggested to NASA Headquarters that a Spot the Station widget, which could be easily embedded on any website, would be a wonderful way to extend ISS public awareness. The widget below was the result, and you’ll note that it is also found in the right column on all main pages of this SSEP website, and in the multimedia section on the SSEP Home page. We are grateful to NASA for creating this widget. You are invited to use the widget to explore Station over-flights of your community, and even embed this widget on your website by clicking on the “About” button in the widget. The International Space Station (ISS) is a truly remarkable laboratory currently located 259 miles (418 km) above Earth’s surface, and traveling at 17,137 mph (27,640 Km/hr) – that’s 4.8 miles per second. It is a massive spacecraft – the largest ever constructed, and is one of the most complex machines ever built by the human race. It is very visible from the ground, and regularly flies over your community. So take this as an invitation to your students, teachers, and their families to plan time to view ISS in the evening, or before dawn, as it flies overhead. You might even think about planning an ISS observing party, getting a presenter to talk about the universe, and asking local amateur astronomers to come out with their telescopes. You could turn this into a community engagement event, celebrating your community’s participation in SSEP and in America’s and Canada’s Space Programs. But in the meantime, while Odyssey II is aboard ISS for the next month, let families know they may be able to go outside and see a most remarkable machine fly overhead. And you’ve probably never seen it because it’s only visible for 6 minutes or less at very specific times, and in specific directions in the sky. 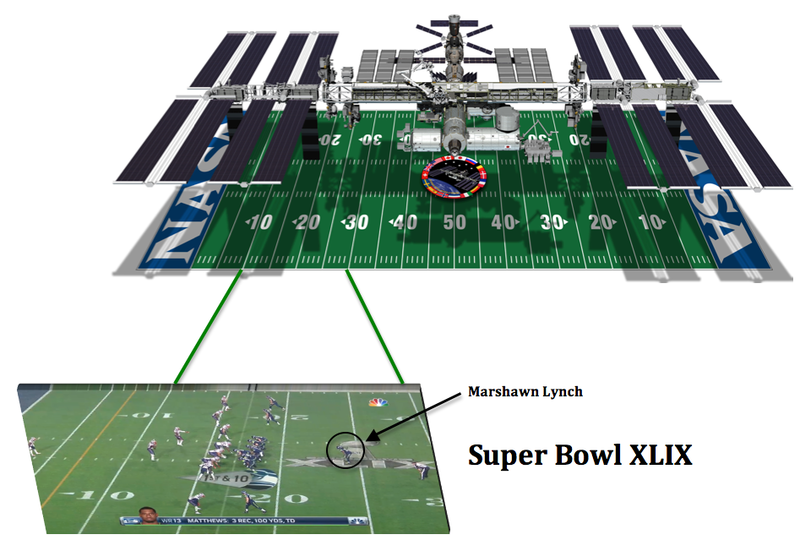 And now for some perspective – did you watch Super Bowl XLIX back on February 1, 2015? Hey, sports fans, how’s this for a teachable moment.